We supported hospitals on both sides of the frontline during the 2014-16 conflict. Europe's second largest country, Ukraine – home to 44 million people – is a land of wide, fertile agricultural plains, with large pockets of heavy industry in the east. Ukraine gained independence after the collapse of the Soviet Union in 1991 and has since veered between seeking closer integration with Western Europe and being drawn into the orbit of Russia. In late 2013, political protests erupted as the Ukrainian government backed away from an association agreement with the EU. Violent clashes between police and protesters took place. In February 2014, Ukraine’s president Viktor Yanukovych was ousted from power and violent chaos ensued. By May, tensions between western-leaning Kiev and Russian-backed separatists plunged the eastern regions of Donetsk and Luhansk into war. Médecins Sans Frontières/Doctors Without Borders (MSF) first began working in the country in 1999. We are still responding to the ‘frozen war’ by treating the psychological effects. We are also providing care for tuberculosis (TB) patients in eastern Ukraine’s penitentiary system. In January and February, fighting between the Ukrainian army and the self-proclaimed Donetsk and Luhansk People’s Republics escalated to a level not seen since August 2014, and had a devastating effect on civilians caught in the conflict zone. MSF teams urgently expanded their support to hospitals on both sides of the frontline. However, heavy fighting trapped civilians in frontline towns and made it difficult for us to reach the hardest hit areas. Medical facilities were regularly shelled, forcing staff to flee and depriving thousands of people of healthcare. A ceasefire came into effect following the fall of the strategic city of Debaltseve on 18 February, three days after the signature of the Minsk II agreement. 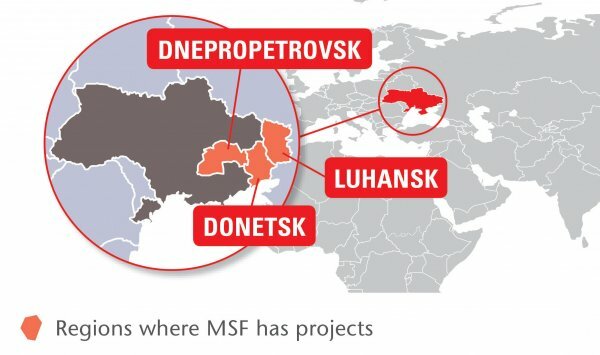 In 2015, MSF donated medicines and medical equipment to more than 350 health facilities on both sides of the frontline, enabling the treatment of over 9,900 patients with conflict-related injuries and more than 61,000 with chronic diseases; additionally, 5,100 women had assisted deliveries. Teams also carried out around 159,900 basic healthcare consultations and 12,000 mental health consultations in cooperation with the Ministry of Health. Although there was less fighting after the Minsk II agreement, shelling continued in many areas and medical needs remained on both sides of the demarcation line. Drug supplies had been disrupted or cut off for more than a year by this point and the prices had increased significantly. People struggled to obtain antibiotics, painkillers and psychiatric drugs, and medications for chronic illnesses such as high blood pressure, diabetes and heart and kidney disease. The supply of essential drugs for tuberculosis (TB) and HIV patients, as well as measles and polio vaccinations, was also disrupted. MSF became one of the major suppliers of medicines for chronic diseases to hospitals, health centres and homes for elderly and disabled people in the east of the country. Our teams provided insulin to more than 5,000 diabetic patients in 16 hospitals in Gorlovka, Donetsk, Yenakevo, Starobesheve, Telmanovo and Novoazovsk, and, also in Gorlovka and Donetsk, hemodialysis supplies for patients with advanced kidney failure. In addition, teams ran mobile clinics in 80 towns and villages around Donetsk, Luhansk, Artemovsk, Mariupol and Debaltseve and through Luhansk region, offering basic healthcare and mental health support to residents and displaced people. Our psychologists provided individual and group counselling sessions for people affected by the conflict, including those displaced or wounded, and the elderly and children. They also trained health workers, teachers and social workers. Throughout the conflict, the MDR-TB programme that we have been managing in the penitentiary system in Donetsk region since 2011 continued until October. The team expanded its support to patients in penitentiary facilities in Mariupol, Artemovsk, Dnepropetrovsk and Zhdanivka. Although we succeeded in working on both sides of the frontline for most of the year, in September our permission to work was refused in the self-proclaimed Luhansk People’s Republic, and at the end of October, our accreditation in the self-proclaimed Donetsk People’s Republic was also withdrawn. The projects were closed, leaving thousands of people vulnerable and without access to essential medical care.